30 days minimun Come join us in our newly remodeled condo in Winter park. For those who like to dally a bit on departure day, we have a later checkout of 12 instead of 11, or 10 like other folks, but we had to change check in until 5 pm to accomdoate the cleaners schedule to do that. IF you arrive early I suggest that you check out your place and if it is ready and clean, you can go ahead in, we just can't assure it. 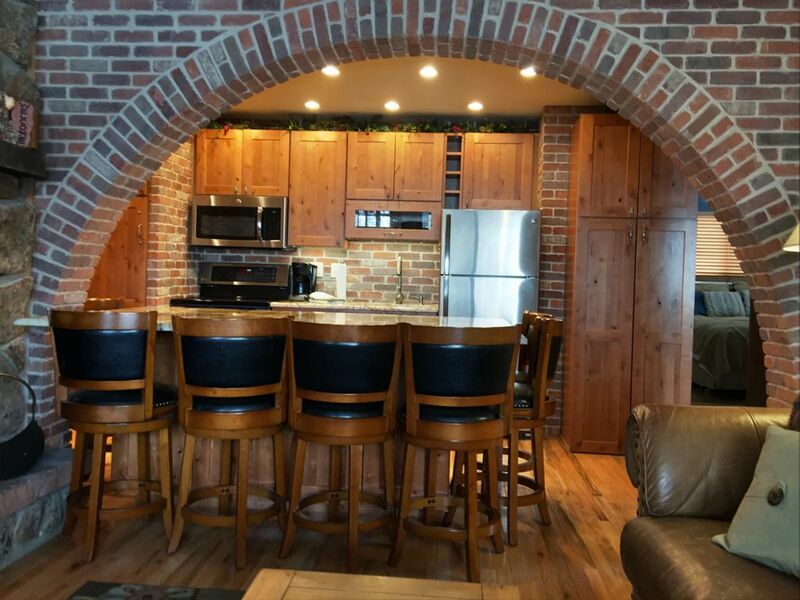 Some people call this the "Winery" or "grotto" since we upgraded with a full brick Arch and new premium granite, We also put in an extra shower to make your stay more comfortable. The bathrooms are both upscale porcelain tile and tastefully decorated , as well as with the Stainless appliances, In the end of 2015 we are upgraded to a Queen sized Marriott bed in one room and a Serta King size in the other. Both are rated number one in type of mattress according to numerous google searches.- (the highest rated by most travel professionals ( check Google) The wood floors add to the warm feel. BEST SKIING ON THE FRONT RANGE= from beginner to advanced ( best moguls in the country according to Ski magazine), Summer MOUNTAIN BIKE haven - over 600 miles of trails and hiking that scour the forest right from the boundaries of the property. (Just head up behind the rec center) Views of Byers Peak, Open the windows and hear the gurgling Frazer river trout stream. From the family room you look across to beautiful evergreen forests frosted in icicles in the winter. A real fireplace adds to the romance, and the accommodation's for 8 (if needed) add to the flexibility and value. NOTE: The Rec Center is finished and offer hot tubs, heated pool TV rooms Even an outdoor hot tub. If more room is needed we rent the one bedroom, one bath, and kitchen unit right NEXT DOOR. It’s a great concept for Grandma and Grand Pa or multiple families. This home is close to the town- we walk to Hernando's pizza, Strip and Tail and the Mexican food restaurant. Rent movies or bring your computer to hook up to the FREE INTERNET. . Make this 'your' place too! Need More Space? We also own the one bedroom unit next door, for privacy or large groups, make some great holiday memories. MasterCard & Visa are accepted. IMPORTANT! THE REC CENTER IS COMPLETE HOT TUBS HEATED POOL ETC. LOCATION LOCATION LOCATION , CHECK OUT OUR New Upgrades for our regular guests include hardwood floors , Brick arch and new bathrooms. New Marriott Queen bed and Sterns and Foster King , each according to individual satisfaction. Stainless appliances More bang for the buck- a Safeway is close so you can save money by not having to eat out every meal. Located in the MAIN SKI RESORT TOWN of Winter Park-not Fraser which is further away, walking distance to many restaurants. Also right on the Frazer river.-which is a blue ribbon trout stream.- 20 feet away! Credit cards- MC, Visa, - easy if your request the exact days on the website. We also have two other one bedroom in the same building that will be remodeled in the summer of 2016 if you have a big group wanting to stay together. One is attached and the other on the first floor that may be accessible for wheelchair. toilet, combination tub/shower, jetted tub, Newly renovated! Winter Park is the main ski village for the ski area and is where is nightlife is. of course for you coffe achievers! The photos were very misleading. The space was very small. It’s also upstairs. A side rail on the bunk bed fell off when our six year old was sleeping- very dangerous. Hello Megan I am very sorry that your vacation wa somewhat dissapointing. We value vacations as important part of unstreesing in todays' busy world, That is why we bought this place for our enjoyment. We do have the square footage of our place listed (995) so that people can make a good choices for there stay. In the Resort areas the other options for this price point are very limited. Compared to the Best Western hotel that lies right on a parking lot on the highway nearby, we offer three instead of one bedroom, a full upscale kitchens and bathrooms with tile not fiberglass showers, excellent washer and dryer, acess to a modern rec center with heated [ool ad hottubs and a location that cannot be beat on a trout stream on the Fraser river. .. These places are not profitable even though my place is rented out very very frequently. We only help to stave off the expenses so that we can use this wonderful place in a wonderufl location when we can take time off. If more space is needed , we rent out the one bedroom place next door. That would give four bedrooms and two complete kitchens. It offer a Marriott King bed and full kitchen too and can be connected for your stay. It adds 445 square feet for almost a 1500 living space. Once again, I am sorry to dissapoint. I hope you can find a better option somewhere in the world on your next vacation Megan. In a nice location, provides all the desired amenities, and very comfortable beds. It was a wonderful retreat for our family summer vacation. Thank you so much Janice for taking the time to write some nice things. I am so glad your vacation was a success! We initially had a hard time choosing whether to stay at the Winter Park resort or offsite ----after staying at this offsite condo, I knew we made the right choice. My wife & I along with 3 teens stayed here for our spring break ski trip. Its close to all the skiing / snowtubing / & snowmobiling sites without the hassle of fighting for resort parking. There is a free bus (pickup right in front of the condo) that picks you up & takes you to all the Winter Park activities. My favorites---nicely stocked kitchen (all cookware - plates -glasses you'll need) / ultra quiet appliances (dishwasher / washer-dryer) / & entertainment. They have well over 100 DVD movies there in the condo - plus access to wifi & Hulu / Netflix thru their DVD system. Another included feature---free Recreation Ctr = Indoor pool / 2 indoor hottubs / 1 outdoor hottub / pool table / workout room / showers-lockers / couches & TV / computer. I enjoyed sitting outside in the hottub--30 degrees above the water / 120+ degrees in the hottub---it was great. The location was good, not a far drive or shuttle run to Winter Park Resort. Hernando's pizza was walkable and a great place to eat. The rec center was nice, crowded at times but nice and the swipe keys didn't work to get in at first so we drove to go get them remagnatized. The condo was small feeling but fine because we wanted 3 bedrooms and I wanted to bring my dog. Having a washer dryer was nice. I did have to wash the shower liner because it was orange and moldy and smelly. The king size bedroom where washer and dryer are was not comfortable, you could tell it was an old mattress with sunk in areas where people have slept. My little brother liked the bunk beds room (hard mattresses) and my parents liked the queen bedroom with attached bathroom. The unit was clean-ish, not super clean. Under couches were dusty and dirty, I only looked because a game piece of ours went under. Appeared no sweeping or vacuuming had happened for awhile. Food items were left in fridge and freezer from previous people? Dishwasher was tiny. The wood fireplace was great, we got wood and used it nightly for the week. We did hear the neighbors a lot and people going up and down the stairs outside front door. We bought food from Safeway in Fraser and prepared meals there mostly, lots of pans, lots, and cooking utensils in unit made that easy. Overall, decent week long stay. It fit our needs and we were mostly happy and found it to be convenient for our needs. Happy I could bring my little dog, great fireplace, good location. Owner was friendly and responsive. We’re driving back to Chicago from an incredible family vacation in winter park writing this review so all the details are very fresh. First, Jasen was amazing to work with as we asked questions about the property to coordinate our stay since it was our first time in Colorado. We even had a question on new year eve and she emailed back within minutes. The condo itself was super clean and had literally everything we needed. All we had to do was grab food at the Safeway right down the street...but all the basics were well stocked. The beds were very comfortable, there was plenty of hot water for a family of 6 and overall we were really comfortable. We even made a fire one night which worked out well. The two best parts of this particular condo is that the bus to winter park resort picked us up right in front of our condo which worked out perfect. The rec center was so clean and new. We met the 3 other families we traveled with at the rec center every night. The kids played pool and poker and swam, the guys soaked in the hot tub and watched the game on the huge TV and there was a large dining room table that we had appetizers and dinner at each night. This condo and location are a really great choice. If you’re debating it...don’t...book now. We visited with children and having access to the pool was perfect. Nice facilities. The kitchen was fully equipped with everything that we needed. Some places don't have half the stuff that this kitchen has. When vacationing with children a kitchen is a must. Thank you! Thanks SO much for the wonderful review..... I hope you were able to make some memories BIll for you and your family..
Pets only with Pet fee (non-refundable) and damage deposit during the lower rent seasons or stays less than four days (refundable to the extent of damage). My cleaner is charging me $20 dollars if the two bunk beds are used. She has a hard time making them. If you don't use them, we will alleviate this charge.